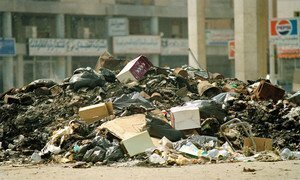 A pile of wreckage left behind in downtown Kuwait after looting and destruction by Iraqi occupation forces in 1991. The United Nations Compensation Commission (UNCC), which settles the damage claims of those who suffered losses due to Iraq’s 1990 invasion of Kuwait, today made $1.3 billion available to six successful claimants. The latest round of payments brings the total amount of compensation disbursed by the Commission to $37.7 billion for more than 1.5 million successful claims of individuals, corporations, Governments and international organizations, states a news release. Successful claims are paid with funds drawn from the UN Compensation Fund, which is funded by a percentage of the proceeds generated by the export sales of Iraqi petroleum and petroleum products. The Geneva-based UNCC’s Governing Council has identified six categories of claims: four are for individuals’ claims, one for corporations and one for governments and international organizations, which also includes claims for environmental damage. The Commission was established in 1991 as a subsidiary organ of the UN Security Council. It has received nearly three million claims, including from nearly 100 governments for themselves, their nationals or their corporations. The United Nations Compensation Commission (UNCC), which settles the damage claims of those who suffered losses due to Iraq’s 1990 invasion of Kuwait, today made a total of $1.02 billion available to six successful claimants.